Sandy's Hidden Damage from Thomas Halaczinsky on Vimeo. SBU investigator Malcolm Bowman begins speaking at 2 minutes 36 seconds. He is also featured in a segment that begins at 3 minutes and 46 seconds into the video. One year after Sandy the discussion about how to protect New York City continues. 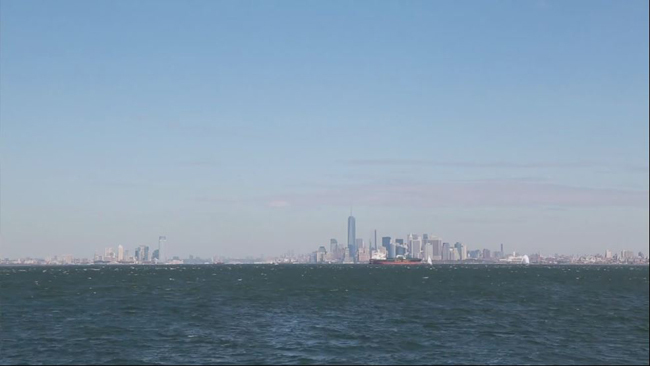 “Sandy’s Hidden Damage”—an independently produced video by documentary filmmaker Thomas Halaczinsky - shows how the storm has changed the city forever—and how experts' opinions on what will save New York clash while some New Yorkers affected by Sandy feel left behind. "It became real to all of us - when the subways were out, when there was no gas at the gas station, when entire communities were decimated," said Roland Lewis, President and CEO of the Metropolitan Waterfront Alliance (MWA), for which New York Sea Grant is one of its some 700+ partner organizations. "The reality of sea level rise and flooding for this region became very real to the entire population. 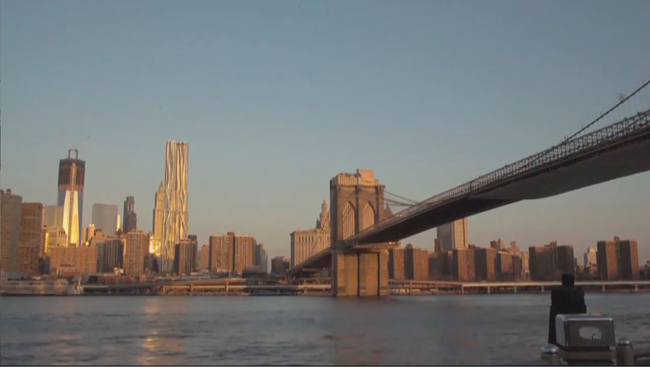 "The big buzz word in New York City is 'resilience''" says Malcolm Bowman, a physical oceanographer at the Stony Brook University's School of Marine and Atmospheric Sciences. For over a decade, NYSG has funded studies of the Stony Brook Storm Surge Research Group, for which Bowman is the lead. "Resilience is kind of a planning tool that New York City has embraced," continues Bowaman. "And, what does that mean? Well, if there is damage, to personal property, to buildings, to infrastructure, that it can be repaired quickly. Put the most vulnerable infrastructure out of harms way by building wall around things, raising them up. But you don't expect to protect everything. I call this a kind of 'local solution.' Another-words, it's like patching pot holes in the highway." At MWA's Annual Waterfront Conference in NYC this past Spring, Bowman and other panelists talked about resiliency and other methods of addressing the resulting forces of and resulting actions from severe storms such as hurricanes, including storm surge. NYSG has transcript content and video clips from that event via the related news item, "NYSG Joins Some 600+ Attendees at Metropolitan Waterfront Alliance's Annual NYC Conference." 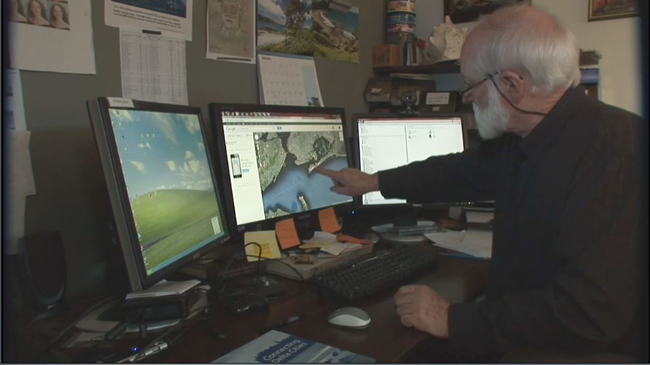 "I have been promoting the idea of European-type storm surge barriers, which I call a regional solution that would protect a lot of this at risk infrastructure," adds Bowman later in the video. 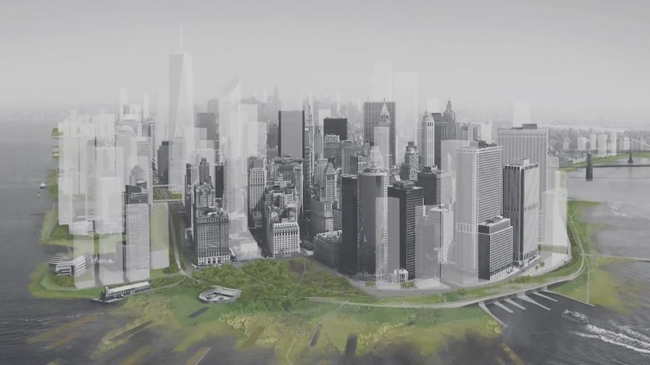 He then shows illustrations of what these barriers could look like for the New York City area (as seen in the screen capture below), explaining the science behind how they could be constructed and how they might work, citing a need for sand dunes to be added to extend the benefit of the barriers in some parts of the harbor system. 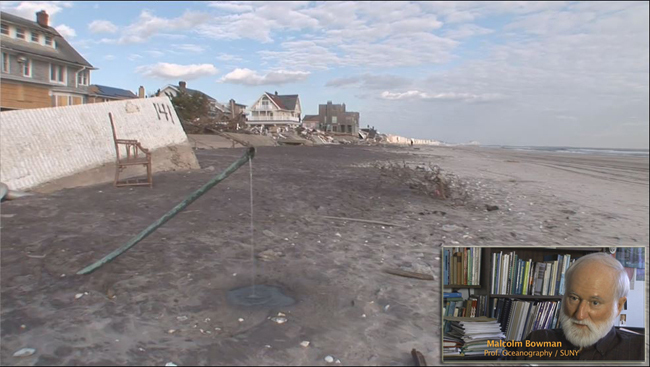 Some scientists—including Dr. Klaus H. Jacob, a Special Research Scientist at Lamont-Doherty Earth Observatory, who is also featured in this video— caution, though, that while barriers could help to keep storm surges out during storms like Superstorm Sandy, they are not an all-fix solution against rising sea levels. Also featured in the documentary are Dr. Michiel Schaeffer, a Senior Scientist for Climate Analytics; Susannah C. Drake, an Architect who cites one of the projects undertaken by her dlandstudio NY firm, the MoMA Rising Currents Exhibition (see photo and information below); and Derek Tabacco from Guyon Rescue, who, in March 2013, toured around Staten Island to sample of the imprint that remained some five month after Sandy touched down in the area. MoMA Rising Currents: A New Urban Ground—dlandstudio partnered with the Architecture Research Office to create “A New Urban Ground” for MOMA’s 2010 “Rising Currents” exhibition, calling attention to Manhattan’s vulnerability to climate change impacts. Currently an oppositional relationship exists between the built city and water. “A New Urban Ground” proposes an integrated and reciprocal organization of natural and hard infrastructure systems. A combination of strategies, including perimeter wetlands, a raised edge, and sponge slips paired with new upland street infrastructure systems, protect the island from flooding in the event of a large storm. For more, visit the Web sites for MoMA or dlandstudio.